We have been continuously adding new Fabric Expansion Joint content to our website. 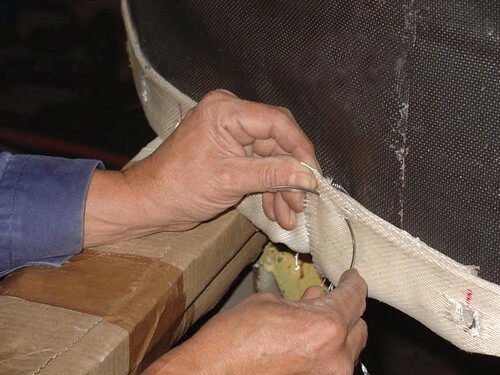 From fabric expansion joint design styles to diagrams and applications, we are creating more and more content in order to answer any technical questions that you may have. Our most recent addition, the Fabric Expansion Joint Application page, shows you where an expansion joint would be applied within a Fossil Fired Power Plant. Check out where they fit in between the air heater, scrubber, fans, and more! 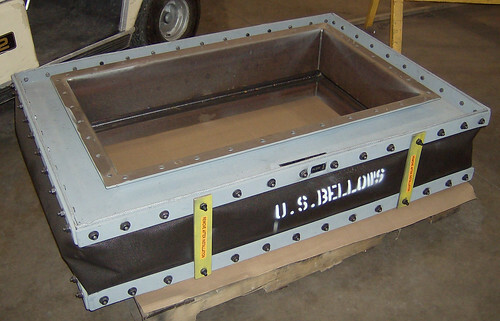 U.S. Bellows designed and fabricated a 78″ fabric expansion joint and duct work assembly with a 90° elbow for a sulphuric acid plant in Louisiana. A stress anaylsis was performed to determine thermal movements and spring supports, loads and travel. The ducts are fabricated from carbon steel and are 30′ long. 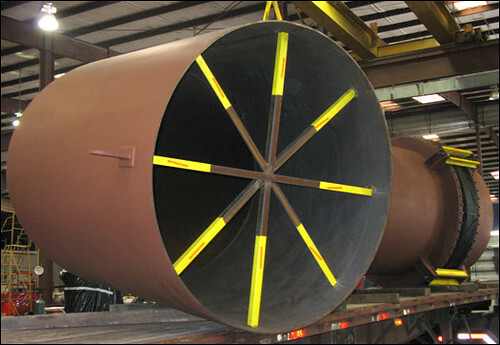 The expansion joint is designed for 750°F at 5 PSIG with 2.5″ lateral deflection (cold preset) and 2″ axial compression. Cradle supports and a “big ton” spring support were also fabricated for this project. 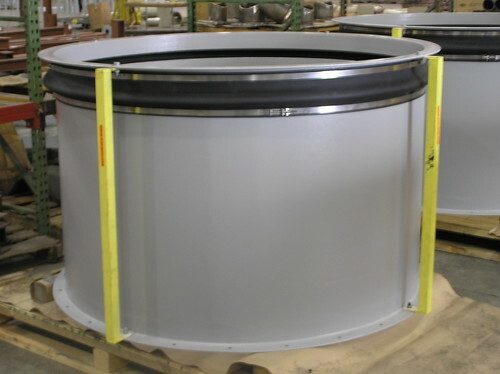 This fabric expansion joint is 13′ long by 5′ wide, and 21″ deep. The frame and liner are fabricated from 304 stainless steel, and the belt is a fiber glass reinforced PTFE material. Prior to shipping for installation in a power generator unit, all the welds were dye penetrant examined. 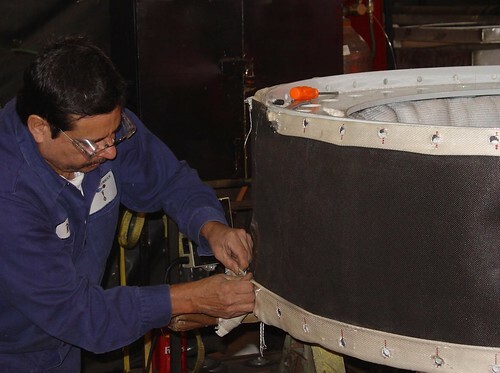 The fabric expansion joints are fabricated from a high temperature and corrosion resistant composite belt with A588A Corten steel duct, flanges, and covers. They are 10′ square and 24″ face to face. All welds were 100% dye-penetrant, and a soap and air test was performed prior to shipping. 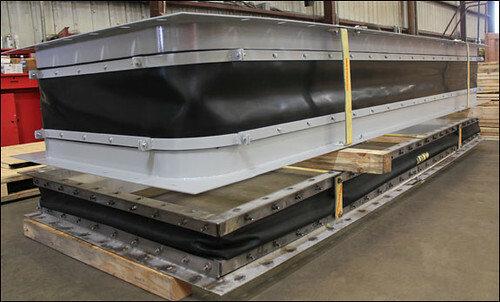 The expansion joints will be used for a flue gas application in an oil refinery in Texas. 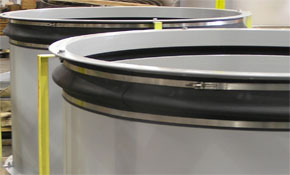 This air duct fabric expansion joint has a unique design that allows for lateral movement of 2″ in any direction. It will be used in an air duct system as a transition piece between the air blower and the air duct. 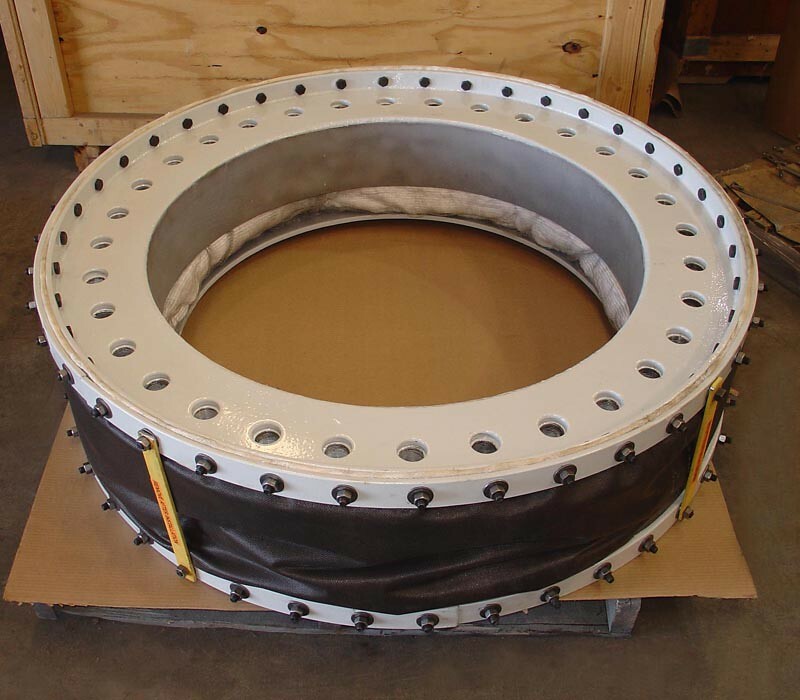 This expansion joint is fabricated with Alpha 827 fabric cloth and A36 carbon steel flanges and has a design temperature of 300ºF at .1 PSIG. The top flange measures 68-5/8″ L x 57-5/8″ W, and the bottom flange measures 53-5/8″ L x 64-5/8″ W.
The fabric expansion joints’ frame and liner are fabricated from 304 stainless steel. The three layer fabric belt consists of an inner layer of silica cloth, a middle layer of mineral wool and an outer layer of PTFE/coated fiber glass. 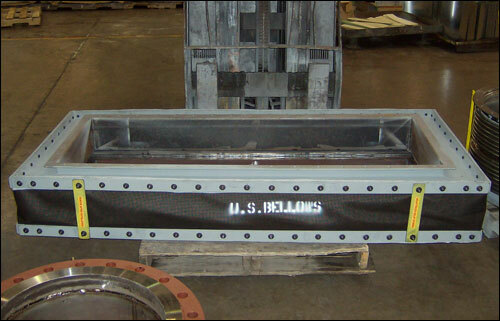 Dye-penetrant examination was performed on all welds of the expansion joint’s frame prior to shipping. 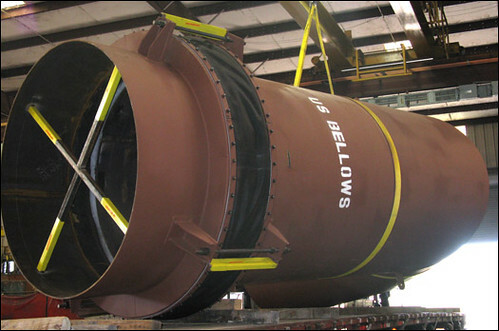 U.S. Bellows, Inc., a division of Piping Technology & Products, Inc., designed and fabricated 44″ fabric expansion joints for a petrochemical plant in Malaysia. 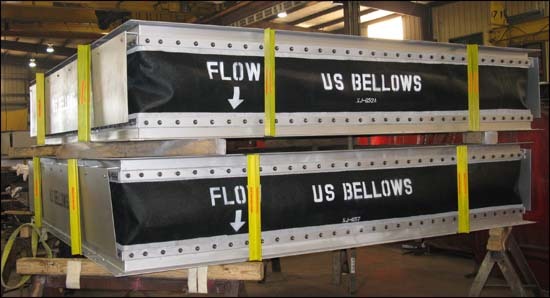 The expansion joints measure 44″ ID x 40″ face to face and are fabricated from stainless steel pipe and flanges and a three layer fabric belt protected by an insulation pillow. The design conditions were 3 PSIG at 845°F. The expansion joints are designed for a lateral movement of 1/2″ and an angular rotation of 1.5°. 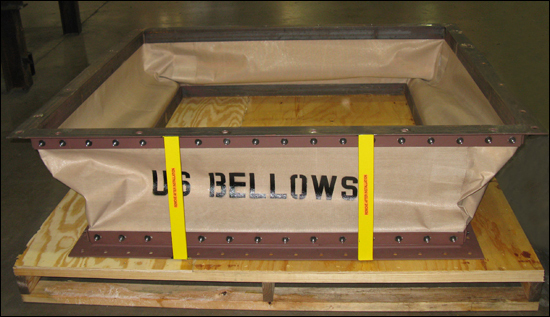 Stainless steel covers were included to protect the fabric expansion element from possible outside damage. 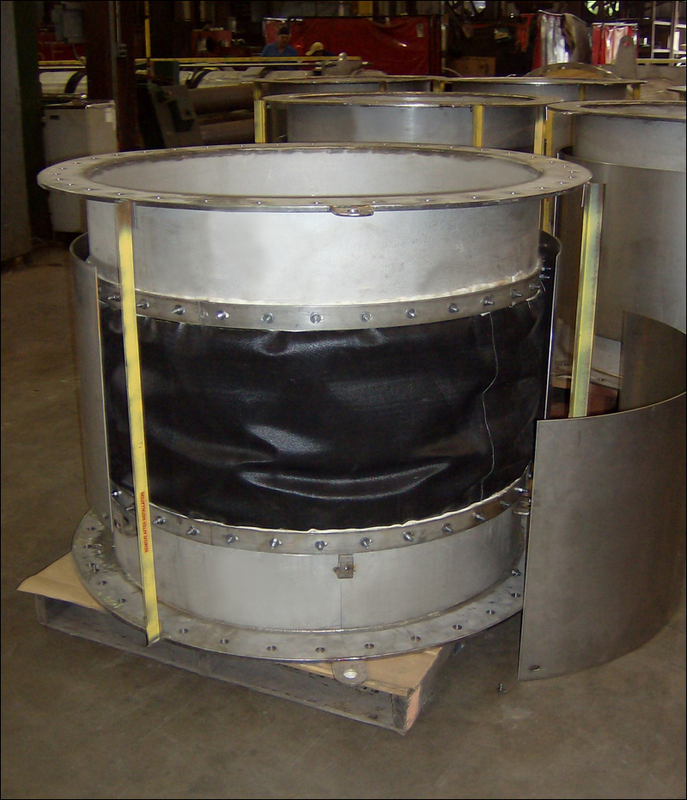 These 59” x 39.5” fabric expansion joints were fabricated using a 1/8” thick neoprene sheet. The joints were then bonded to the carbon steel angles and plates, and secured using stainless steel band clamps, with T-bolt latches. The carbon steel angles and plates were primed and finished at Piping Technology & Products’ paint production facility. The expansion joints were designed to facilitate any vibration and movement during the generator units’ normal operation.